Death incarnate! Sporting incredible firepower, the four cERLBLs and the cLRM10 can cut down the enemy at long ranges, and if it survives the punishment, then the two cUAC5s and the battery of cMPLs can demolish whatever remains. This amazing damage potential is only hampered by the immense heat it creates, so firing discipline is required. Its also very slow and requires good piloting to make the most of its attack windows. The Prime, along with all Daishi variants, sport some of the thickest armor found in any Mech - a whopping 19 tons, granting it unparalleled durability on the battlefield. This variant, known as the "Pain-killer", packs a trio of cLPLs in its right arm, combined with a torso-mounted cGauss and pair of ATM6 launchers loaded with extended range ammo. 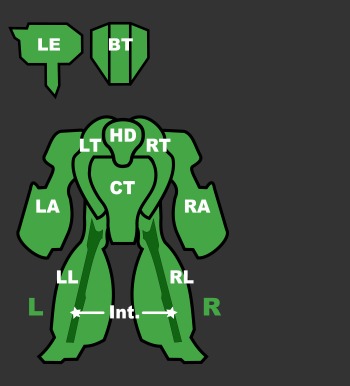 This allows the A to induce consistent screen-shaking on an enemy while exploiting the holes in the armor with the pulse lasers. LAMS and GECM help keep this wolf in the fray until it can exhaust its ammo supply, of which the A is somewhat lacking with only a single free ton available. 13 DHSs help keep heat troubles at bay, although constant use of the LPLs will overwhelm them with little difficulty. Adequately dubbed The Widowmaker- This was the preferred variant used by Natasha Kerensky herself. Twin cERPPC's batter distant enemies until within range to finish them off with the powerful cLBX20 and a barrage of Small Lasers and cSRM4. Two LAMS help to keep missiles at bay, and furnishing 14 Dual Heat Sinks allow for continuous widow-making action. Still, as with most Daishi variants, the pilot must be cautious with their firing rate and choose shots carefully when scoring the killing blow. Single B-Pod serves to finish off any wounded Battle Armor, should any fall before your warpath. An oddity among Daishis, the C sacrifices a large amount of direct-fire capacity to carry a Clan Arrow IV missile system. It also carries two cERPPCs for engaging heavier units and eight cLBX2s for anti-air and light Mech disposal. Of all the Daishi variants, the C is best kept at distance from the enemy, operating both as artillery and fire-support, especially when TAG or NARC painting is available. GECM and LAMS enable the C to mitigate opposing LRM barrages directed at it. A born-and-bred brawler. The Daishi D is a true terror in urban combat with its two cUAC10s and a cUAC20 with three dual cSRM4 packs for clean-up and anti-BA duty. This Mech can, with a little pilot skill, blast an opposing Mech's head open and saturate the pilot inside with a hailstorm of SRMs. GECM and three tons of available space give the D some staying power and enable it to ambush units when it can get into position. Like all Daishis, the D is not a fast Mech and with no weapons that have a range beyond 700m except the 4 MGs which is well suited for Aero, VTOL or putting a damaged asset down. It must rely on ECM cover and support from its teammates to get into the fray without being weakened by snipers. 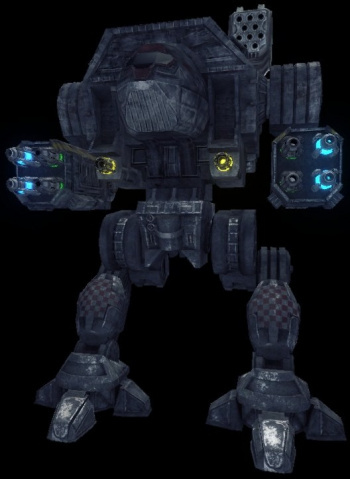 The D's combat endurance is also quite hampered by its over-reliance on ammo-based weapons; combined with its poor speed, reloading this Mech is often not an option. Two cLRM20s and a HAG40 make this a fearsome extreme range denial asset. Supported by four HMLs when something does manage to get close ensures that it's more than a match for all but the mightiest brawlers in close combat as well. GECM+the pair of LAMS make locating and suppressing this Assault Mech with missile fire difficult as it can easily slip away to re-position unseen by most radar systems while serving as a mighty anchor for its team to rally around. Its heat-management is also adequate unless firing the lasers and missiles at the same time, so staggering your fire slightly is recommended. If this variant has any real drawback, it's that it has trouble dealing with heavier ASF that don't need to be scared of the HAG40 cutting through them before delivering their bomb payload. The "Beehive" Daishi is an exceptionally potent mech against anything that can't close against its ATM12 and dual ATM9's minimum range or stay out of its maximum range. While the longer lock-on times of the ATMs and the heat they generate requires you to pick your engagements carefully, your GECM is the perfect tool for deciding when to strike and making the engagement on your terms. The quad cERMBL are extremely potent backup weapons either for stripping weakened components or as a deterrent if an asset gets inside your minimum range. A pair of cLBX5es further help it pressure targets when its ATMs are cooling down. Additionally, the synergy of the ATMs and LBXes make this an exceptionally potent tank-buster as they struggle to close inside your minimum range before your bee's rips them to pieces. The Daishi G is a bit of an oddball in that it doesn't excel in any one area, but does everything reasonably well. It has just barely enough heatsinks to make its dual HLLs viable, and can couple them with its cGauss and periodic cLRM15 fire can add to the screenshake it provides to let it get a full, precise burn with its lasers. If an enemy gets close, it packs a fearsome punch with its cLBX20 to deter all but the most dedicated brawl assets from engaging it. The two MG's with their 1600 meter range are increasing C-Bills and scoring a kill on a badly damaged asset. Should any Battle Armor be foolish enough to get too close to you, B-Pod will help with its disposal. Since this Daishi is more of a generalist of all ranges, it's best to read the situation and pick your engagement ranges where the other team is least comfortable fighting you rather than trying to force specific engagement brackets on your terms like you typically would with other more specialized assault assets. The Daishi (Japanese for Great Death, and the IS codename for the Dire Wolf) is a Clan Assault Mech introduced with MWLL version 0.6.0. The first sign of this mech was a placeholder xml data accidently(?) left in the beta 0.5.2 release and found by user Come and See. The final 0.5.7 pre-release media unveiled it as a planned addition for release 0.5.7 (later renamed to 0.6.0). The Dire Wolf was the brain-child of the Clan Wolf scientist caste, but was actually first produced by Clan Smoke Jaguar. Hearing rumors that Clan Wolf was developing the "Ultimate Assault OmniMech", the Jaguars won the plans and production rights in a trial that, rumor has it, was fought dishonorably. Production commenced on Huntress in 3010. In 3019, Clan Wolf began production of the OmniMech on Strana Mechty as well; Star Colonel Ulric won a trial of possession to expand manufacture into Clan Wolf. Beyond the limited manufacture of the Dire Wolf on Outreach, all Dire Wolves outside of Clans Smoke Jaguar and Wolf (or the Wolf's Dragoons) are either gifts, isorla or were acquired through trade. The Dire Wolf is one of the OmniMechs that became feared throughout the Inner Sphere during the initial Clan Invasion and rightly so. This page was last edited on 24 March 2019, at 20:14.